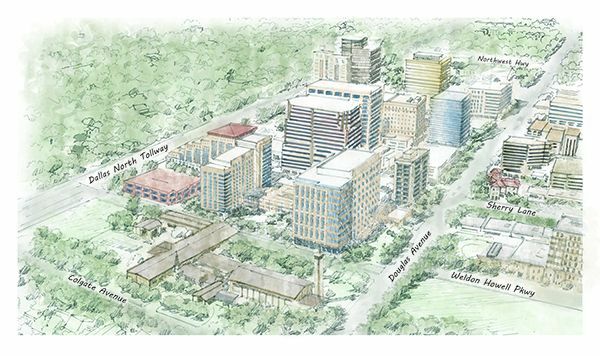 September 6, 2018 (Dallas, Texas) Saint Michael and All Angels Episcopal Church today announced plans for a mixed-use development on their property along Douglas Avenue in the southwest part of Preston Center. The plans include a midrise “Class A” office building on Douglas Avenue and a residential building on the western side of the site. The project will feature a full-service restaurant with a patio and other ground-floor retail that open onto public green space along Douglas Avenue. The current zoning on the development site allows for high density office on the west side and multifamily development on the balance. Saint Michael and All Angels has submitted an application with the City of Dallas to update the zoning to a comprehensive PD (planned development). The proposed zoning change is commensurate with the existing zoning rights and densities the property already enjoys and is focused on a rearrangement of allowable uses as opposed to requesting additional density. About Saint Michael and All Angels Episcopal Church. Just south of Northwest Highway off of Douglas Avenue, Saint Michael and All Angels is a vibrant Episcopal Church started in 1945 in a Boy Scout hut located on the grounds of the University Park YMCA. Several months later, on the Feast Day of Saint Michael and All Angels, the group, which by then had become several hundred persons, executed the charter and formed Saint Michael and All Angels Episcopal Church. Today our community is one of the largest in the country, seeking to help those around us in need, and deepening our personal faith in a pursuit of Jesus Christ. About Lincoln Property Company. Lincoln Property Company, founded in 1965 by its chairman Mack Pogue, is a Dallas-based, privately-owned real estate firm involved in real estate investment, development, property management and leasing worldwide. Lincoln has offices in all major markets of the U.S. and throughout Europe. Lincoln’s cumulative development efforts have produced over 130 million square feet of commercial space and over 212,000 multifamily residential units.